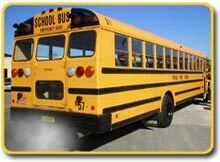 Under New Jersey's plan to reduce the public's exposure to fine-particle pollution, school-bus drivers are being asked to pledge voluntarily to eliminate idling. School officials can pledge to reduce diesel emissions from school buses and protect the health and well-being of the community. Take Action - Send us the name of your school so we can add it to our list of schools taking action to Stop the Soot. Look who's taken the the no-idling pledge!